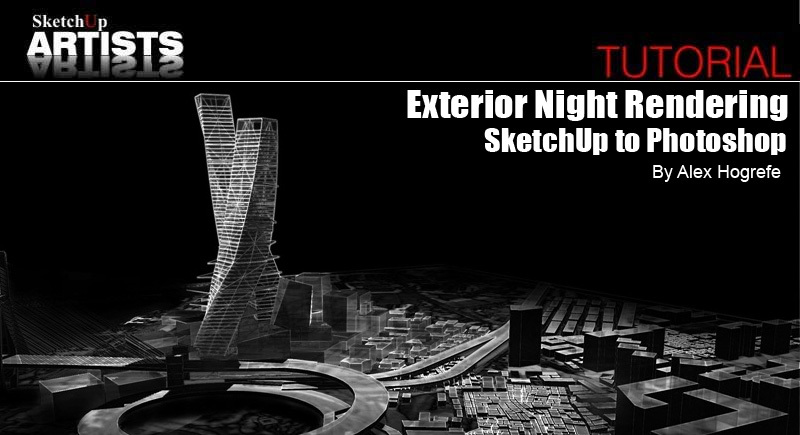 This tutorial will create an artistic night rendering by exporting images from SketchUp to Photoshop. 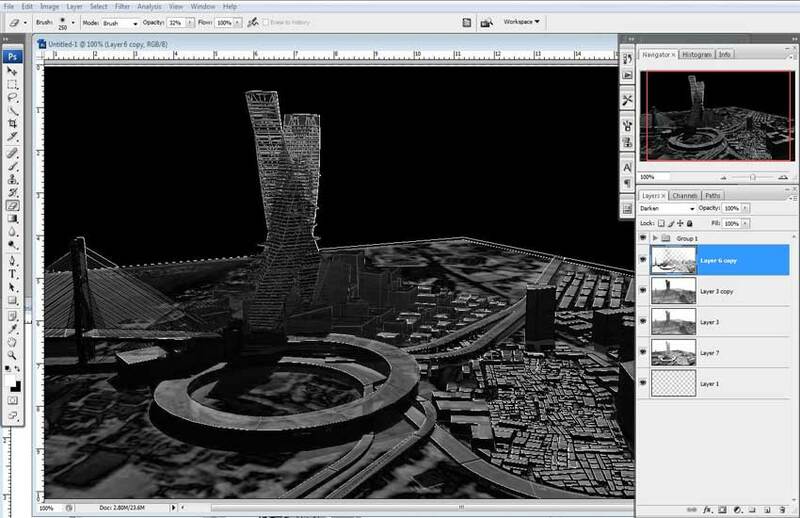 As in some of my previous tutorials no external rendering programs are needed… saving a lot of time! 1. 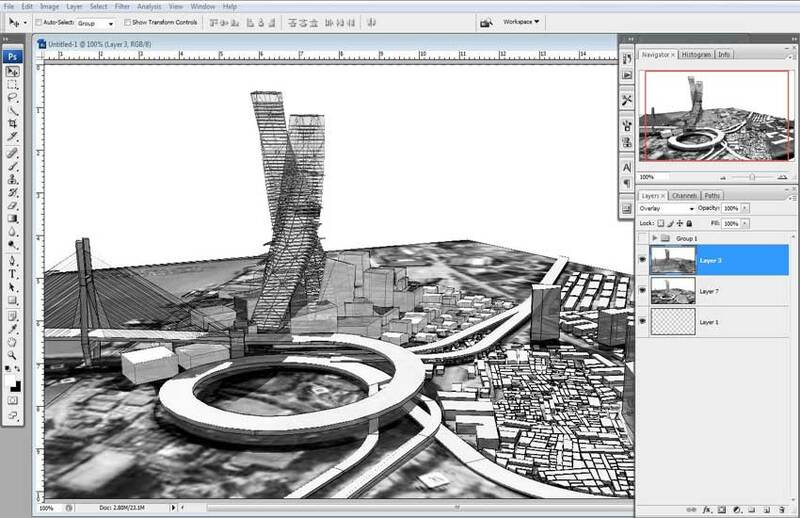 Firstly, a SketchUp view should be saved, as multiple images will be exported and overlayed in Photoshop. Accidentally moving the view will make it almost impossible to get the images to line up correctly on top of each other later. 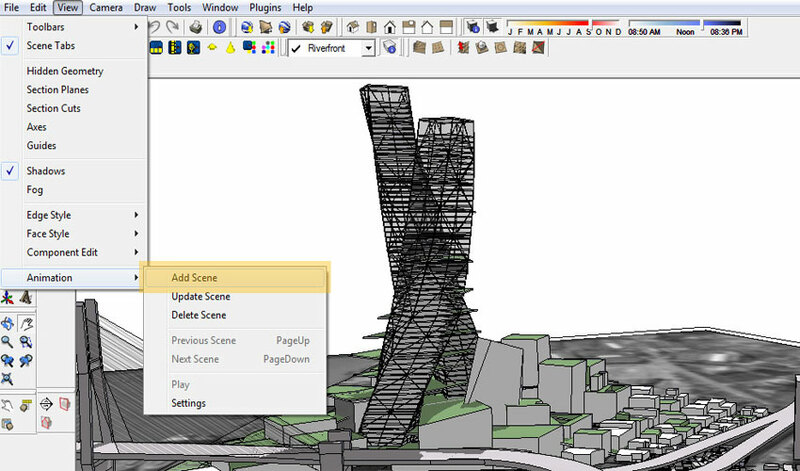 This can be done by going to View>animation>add scene in SketchUp. (You can do this all by going to Window > Styles and the Styles Panel will appear. Clock on the Edit Tab to set up these settings). a. FACE STYLE: Shaded With Textures, EDGE SETTINGS: NO edge lines. Shadows set to on. b. FACE STYLE: X-Ray on and Shaded With Textures, EDGE SETTINGS: Shadows on, Edges on. c. FACE STYLE: Hidden Line, EDGE SETTINGS: Shadows on, Edges off. 3. In Photoshop, open the first image with Shaded With Texture but no Edge lines, Shadows on. Desaturate the image (Image > Adjustments > Desaturate). 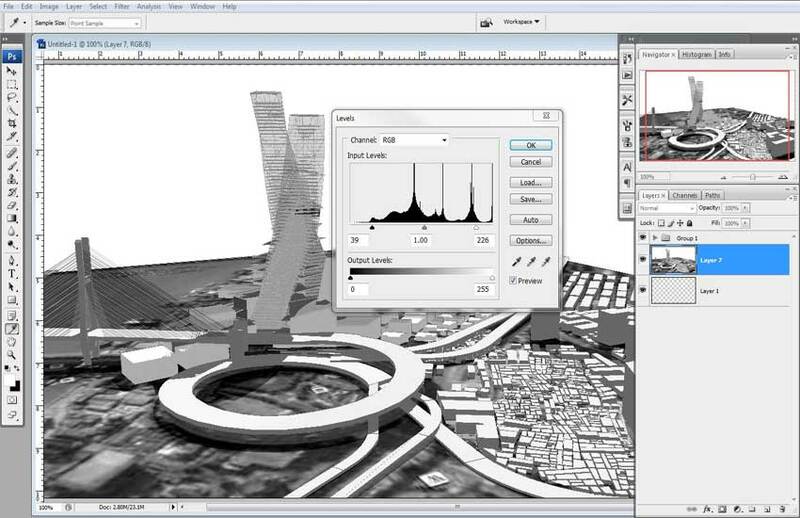 Adjust the Levels so that the gray tones are a little more dramatic (Image > Adjustments > Levels). 4. Open the second image with X-Ray mode, Shaded With Textures with Edges and Shadows on, in a new layer above the previous layer. Set the blending mode to Overlay (blend modes are found in the layers palate on the top left). 5. Next, duplicate the top layer (X-Ray with Edge lines). 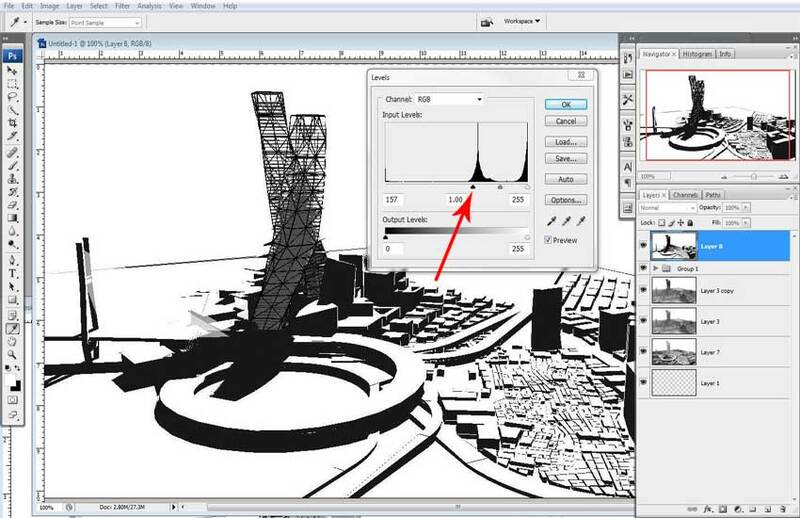 Change the blending mode of the layer to Difference. 6. Open the final image with Hidden Line, no Edges and shadows on and set it as the top layer (on top of the pile of layers). First, the shadows need to be darkened to black. To do this, bring up the levels panel (Image > Adjustments > Levels or Ctrl+L) and move the left little black triangle to the right until the shadows are pure black. 7. Next, set the blending mode of that same layer to Darken (Note: This step will darken shadows in the overall image giving the rendering more depth. However, in some areas you may not want pure black shadows in which case you can erase or lower the opacity of the layer). 8. Finally, create a new layer and move it to the top. 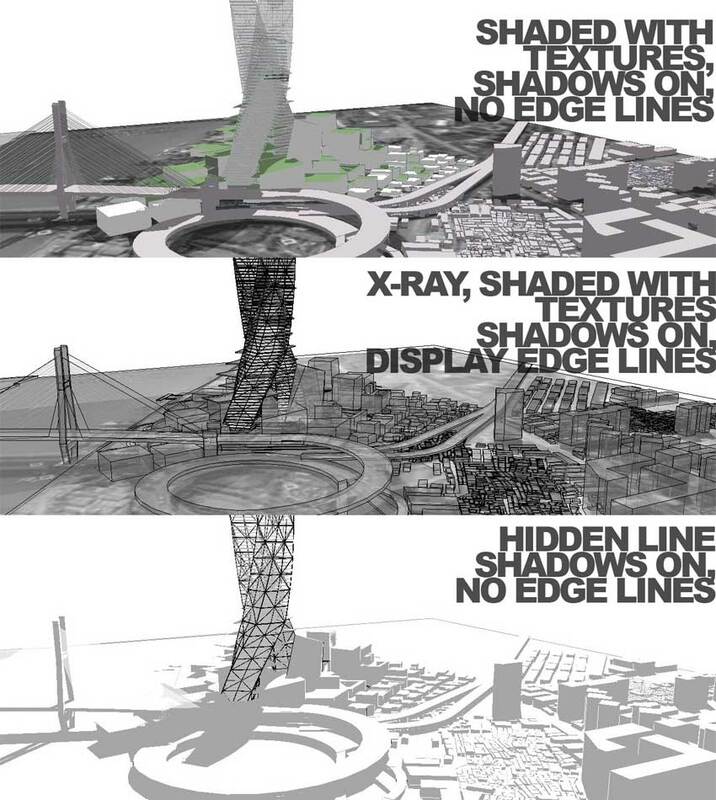 With a paint brush (set to round soft, opacity set to 50%, and color set to black) paint edges in the background where the ground plane ends, as well as around the boarder creating emphasis to the center of the rendering. I also made minor tweaks to the towers and other areas by erasing sections of certain layers and adjusting the levels of others. Since this was more image specific, I didn’t include it in this tutorial. 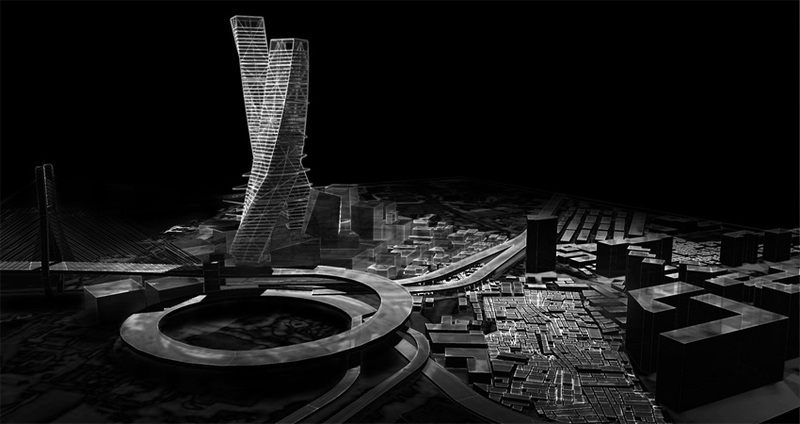 The final rendering, based on this tutorial, is achieved in a pretty short amount of time with no external rendering engines needed, just Photoshop. 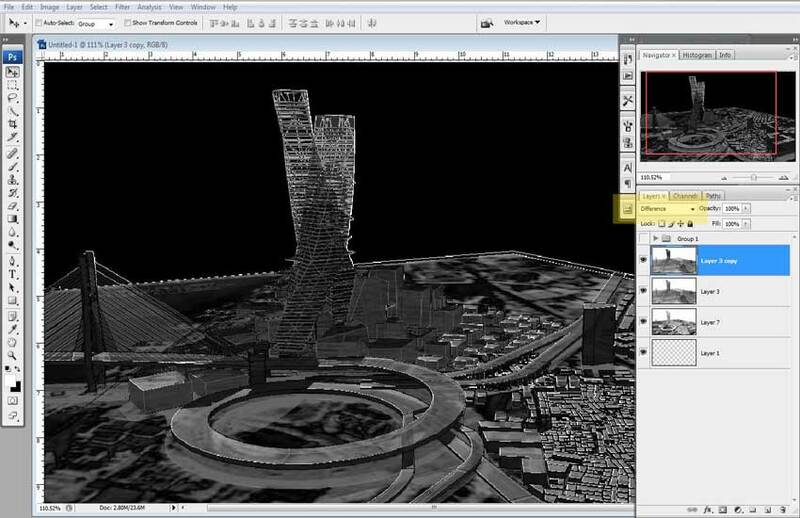 Exporting the SketchUp images at higher resolutions will dramatically increase the quality of the rendering. I usually try to export at twice the screen resolution or higher. Line work is usually much cleaner when this is done. I hope you found this tutorial useful and a new quick way of achieving an exterior night render without having to actually render it using a separate rendering application. Thank you, I really appreciate the tutorial. Nice technique Alex and easy to remember…love the SketchUp to PS tuts! Another excellent use of photoshop. thanks for sharing. real tnx … alex! your works are great!